With a Ph.D in comparative jurisprudence, legal scholar and Aboriginal rights activist Bruce Clark gained international attention in 1995 during the volatile, summer-long standoff between Aboriginals and police over land rights at Gustafsen Lake, west of 100 Mile House, at the end of a dirt road. When Clark arrived and vigorously represented the Aboriginals as their legal advisor, he was summarily dragged away by police. His wife's car was blown up soon afterward and he was later disbarred from practicing law in Ontario in 1999. Depicted in the media as a "rogue"; lawyer, Clark moved his family to Norway and wrote an account of the Gustafsen Lake showdown, Justice in Paradise (1999). He had previously published Native Liberty, Crown Sovereignty: The Existing Aboriginal Right of Self-Government in Canada (1990). The simmering confrontation at Gustafsen Lake arose after Percy Rosette, a Faith Keeper of the Ts'Peten tribe, built a crude shelter and began to prepare the site for a Sundance ceremony. The allegedly sacred ground was located on unoccupied land for which cattle rancher Lyle James had grazing rights. 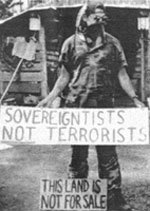 After Rosette had been joined by other members of the Ts'Peten tribe, Lyle James and 12 armed men arrived on June 13, 1995 and served the would-be Sundancers with an eviction notice, affixing it to a sacred staff. When James and his men paid a second visit, one of them allegedly said, "This is a good day to string up some red niggers." They took the door from Percy Rosette's shelter, plus the wood stove that was inside it, and vowed to ensure the RCMP removed the squatters from their camp. As an intermediary, an RCMP officer, also an Oneida Aboriginal, asked to be part of the proposed Sundance event. It went ahead without incident. More trouble arose on August 11 when two of the Sundancers named David Pena and Ernie Archie were arrested for fishing illegally in the Fraser River. During this arrest, the Aboriginals asserted their right to gather food for their families in a traditional way. Tensions were such that one of the arresting officers felt obliged to draw his gun. Vehicles were searched and the police found several hunting rifles belonging to the Sundancers. This was taken as evidence to support growing suspicions and fears that the Aboriginals and their supporters were planning to remain and defend their right occupy the site. A week later the Sundancers spotted seven men in the bushes wearing camouflage but it was never made clear whether these men were vigilantes or officers of the Crown. After Attorney-General Ujjal Dosanjh referred to the Sundancers as terrorists, shots were fired at an RCMP vehicle on August 27. Representatives of the Sundancers maintained there wasn't any shootout and the lives of police officers had not been threatened, but the RCMP claimed their men had been endangered by a reckless "hail of bullets." Lawyer Bruce Clark appeared at the Gustafsen Lake encampment four days later. With bullet casings in hand, and an affidavit from some journalists, Clark argued that police were the instigators of the alleged shootout. With military support that included armoured personnel carriers, the RCMP were on high alert. On September 11, two Sundancers were immobilized on the way to get water from the lake when their vehicle evidently ran into a land mine. As the men fled with their dog, they were allegedly under heavy fire from the RCMP. The situation was defused somewhat by the arrival of Chief Arvol Looking Horse, a spiritual leader from South Dakota, consulted with the police and subsequently encouraged the Sundancers to leave on their own volition, promising they would not be hurt. On September 17 the encampment at Gustafsen Lake was abandoned and most of the dozen remaining Sundancers were taken into custody for questioning. A ten-month trial ensued during which 18 people were faced with a variety of charges that resulted in 21 convictions, 39 acquittals and prison sentences ranging from six months to four-and-one-half years. For Bruce Clark, the Gustafsen Lake standoff confirmed his belief that the North American legal system has led the genocide of indigenous people and that many Native leaders have been complicit in the process. "My own experience," he wrote in Justice in Paradise, "has been that the native governments and organizations with enough money to wage the legal contest vindicating the aboriginal right of third-party adjudication ultimately prefer to spend it on personal consumption..."
Clark, Bruce. Native Liberty, Crown Sovereignty: The Existing Aboriginal Right of Self-Government in Canada (McGill-Queen's, 1990). [Alan Twigg / BCBW 2004] "First Nations" "Law"